What is in your grocery cart? For those of us who eat paleo, it can be tough not to judge other people for eating junk food. While on the paleo diet we go to such crazy lengths to be as healthy as possible. Often when I am at the grocery store I can’t help but look into the cart of the person in front of me and see what they are buying. I almost always see the same crap, lots of processed foods, sugary drinks and a ton of carbs. I see few if any fruits or vegetables. Usually when I look at the person buying all of the junk food I can correlate fairly well how much junk food they buy to their waist size. It is no surprise why we have such an obesity problem in this country. When I check out my basket is always filled with the most healthy foods. Here is a picture of a recent trip to the grocery store. I bought chicken ($3 a lb! ), ham, crab, eggs (omega 3 enriched), broccoli, bell peppers and apples. It was about 16 meals worth of meat and 9 meals worth of fruits and vegetables all for $48. Not a bad deal. What was in your grocery basket last time you went to the store? Do you judge other people on what they buy in the grocery store? I totally judge. Can’t help it. I judge my prior obese processed-food-dependent self as well. I went to the supermarket for a few things today, staples and dinner supplies. I bought portabello mushrooms, two bags of baby spinach, bananas, honey, balsamic vinegar, an avocado, a can of ground peeled tomatoes, almond milk and two jars of natural peanut butter (peanuts, trace salt). I was behind a woman (on the thin side) who was buying three two-liter bottles of Mtn Dew, two packages of Little Debbie pastries, two bags of potato chips and two packages of bologna. Sounds like you eat pretty healthy. Wow, the other woman had no real food at all. So sad. We all cheat on our diets sometimes, only human. I am starting to think a lot about what I will eat first when my paleo challenge is over. Some sort of dessert. 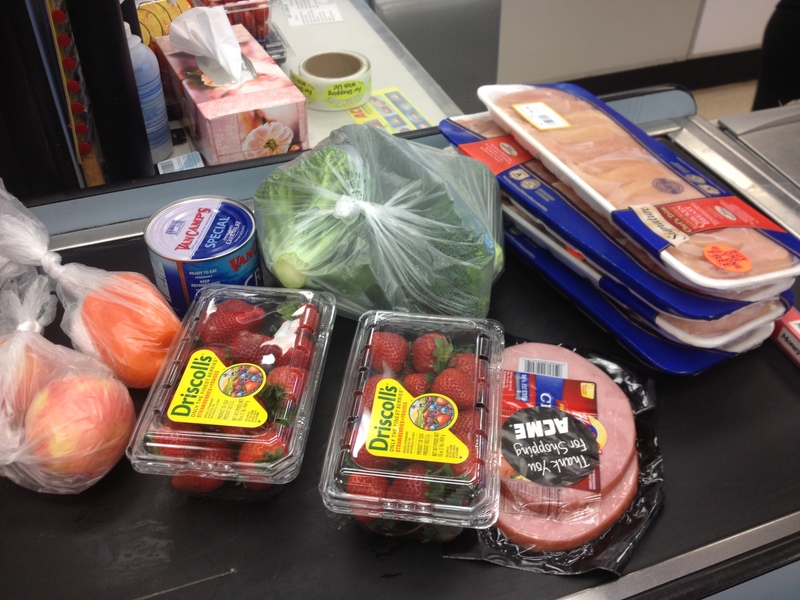 I am TOTALLY guilty of judging other people’s grocery carts! Especially parents who are buying their kids sugary cereals and meats shot up with antibiotics and who knows what else! I just want to go shake them and tell them to save themselves early on before they cave into eating the SAD diet like everyone else. You are right, it is so sad that even our children are getting fat. Parents should be responsible enough to feed their kids real food. Best of luck battling your sweets addiction. It is something I struggle with every day. Especially because my roommate has junk food everywhere and I see it and want to eat it. I try really hard to not judge…but I’m super envious when I see someone with a cart full of goodies. Paleo would be so much easier if we weren’t exposed to all the junk food everyone else eats.